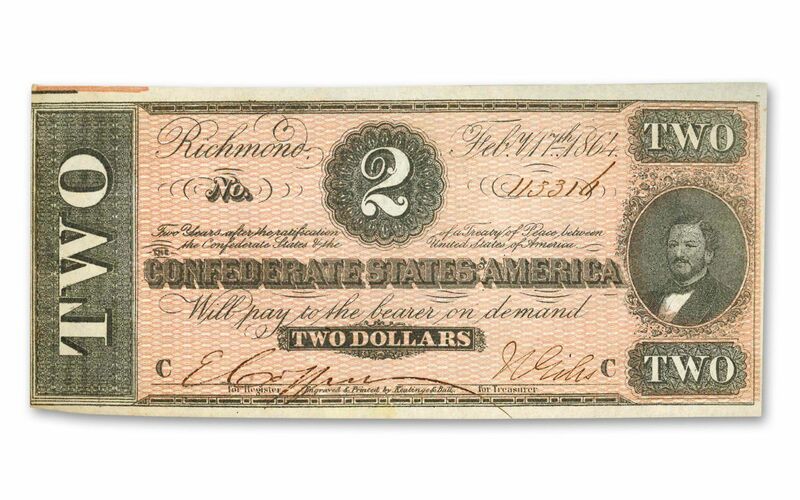 In 1864, right in the middle of the American Civil War, the southern Confederate States of America printed its own currency, including these $2 notes. More than 150 years old, they have survived in About Uncirculated (AU) condition. Since most of these notes were destroyed following the Southern defeat in the Civil War – they were deemed worthless with no government to back them with hard assets – finding them is miracle enough, but this discovery is something extra special. Tucked away in the back of a safe owned by one of our suppliers was a number of 1864 $2 Confederate Notes with consecutive, hand-written serial numbers! These notes are already highly coveted among Civil War enthusiasts and numismatic collectors. Add in the consecutive serial numbers – on notes that are more than 150 years old – and you have a Civil War collectible worth bragging about. 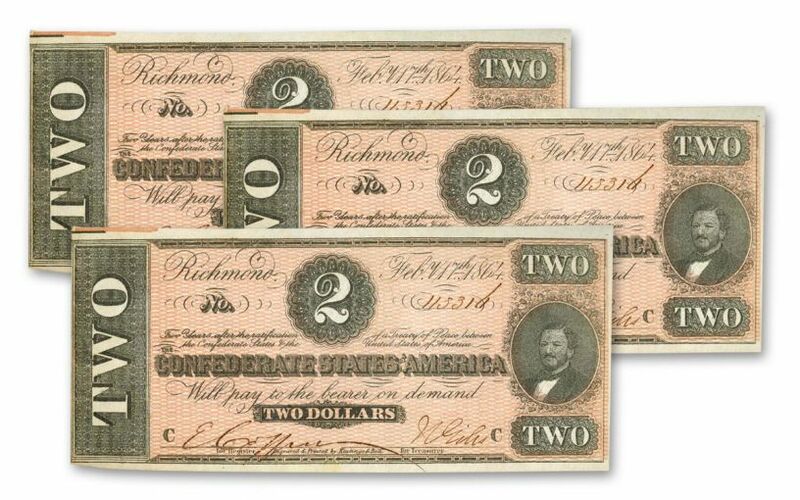 These $2 paper notes not only mark the last of its denomination, they were also was from the 7th and final series of currency issued by the Confederacy. Each note features a portrait of Confederate Secretary of the State Judah Benjamin, one of the most capable members of President Jefferson Davis’ cabinet. During the Civil War, Benjamin also served as the South’s attorney general and secretary of war. When the Confederates lost a battle, he refused to reveal that they didn’t have any available reinforcements, instead accepting a congressional censure. After the war, he spent days burning personal correspondence and government documents before escaping to England, where he became a successful attorney. An interesting fact about these notes is that each was personally hand-signed by the wife of a Confederate officer. Southern Treasury officials claimed this was done as an anti-counterfeiting measure. The fact of the matter, however, was that the sheer number of bills being printed meant the notes could not be individually signed by two men each. Instead, a small army of women were often hired to sign the various notes! Here's your chance to secure a 3-note set with hand-written, consecutive serial numbers. Only one 3-piece set exists in our vault, so be sure to secure these exciting pieces of Civil War history today!